Today started with a bad headache. My ears are burning from the ear pins. Two have dropped out, Three are left. I think the RSD is reacting to them. Three of my ear pins. On the common while walking Summer I slipped, I tried to stop my self from falling and pulled my back. I now have shooting pain down my legs with a lump in the center of my back. Pilates- A lot of the moves were painful because of the pulled back but I did feel better later in the day. My daughter came with Paul to pick me up and had Jamie-Lee with her. Every one liked her. As usual she was hungry so a bit grisly. Another pin fell out so only one left. Bed late 6.30 am because I fell asleep for a while. Up about 8.30 I feel quite stiff back hurts this got better as the day went on. Physio - The usual questions and pulse taking. I think the team are interested in my RSD as they go on this Blog. Speaking to them I said what was done last week was a bit too much for me. (massage ear pins and acupuncture). They agreed. Martin asked about the ear pins. I said its hard to say as every day is different. I did say my balance was a lot improved. Pain levels are a bit up and down. Also its very cold now. As most of you will know cold is not the RSD’s friend. No snow here as yet but other places have some. 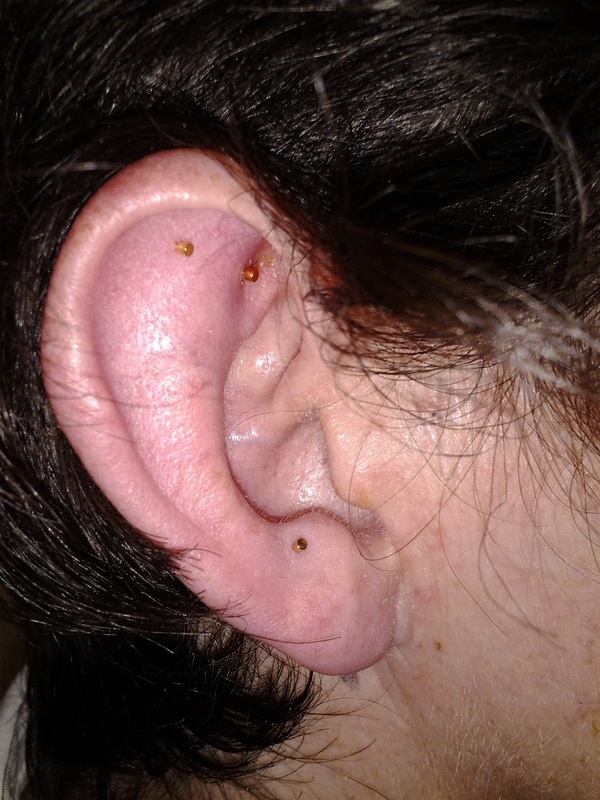 This week Martin put pins in the other ear (left one) the ear went very red. The pins covered with plasters. This made me feel very light headed and hot. I soon recovered though. They were very pleased as they did not want a repeat of last week when I had a blackout. A massage from one of the team, it was very soothing. She said I did not feel as tight in my back and neck muscles. Later on I had a sick feeling and weird taste in my mouth. My ear felt very tender when touched. Not a bad night for me slept from 6am to 9am. I feel quite stiff but not too much pain. Ear a bit sore on pin at the bottom. I have a sick feeling still a lot of the time as well. Not sure if this from the treatment or something else. My hip hurts today but I have bean doing a lot of walking. Took Summer on the common at the moment its very wet and muddy. She loves it and slides on her belly in the mud and water. One very mucky dog came home. Today I had about the same sort of day as the previous ones. I think I am getting a cold or some thing as my throat is sore and I feel very cold a lot of the time but also very hot at times as well. I hope I am wrong. Not had a good night, spasms along with hot and cold sweating as well. I need to go into town today as well. Got too much shopping and just managed to get it home. I suffered for it pain everywhere - spasms, as well as shooting pains all over. After sitting down for a while for a rest and cup of tea I got a violent headache and my nose started to pour with blood. This went on for a while. I took some IBRUES and this helped a little. My headache calmed down only to return more powerful later in the night. Not a good day. Pilates, even though my shoulder was very tight, it went quite well. I was near the heater this week and warm . I kept saying it was like Bermuda. I was in the middle of the hall last week so was colder. My throat is sore but I don't feel not too bad. Went to a party with the Breath Easy group, a health charity, my neighbour has emphysema and belongs to this. The party was not the best but we had an afternoon out. Late night early morning I had a hot cold session. I could not stand, freezing cold to touch shaking so cold. My throat felt very sore and I had tight chest, so I went to bed feeling very strange. I think I have a bad virus or something. Got up a bit later. Throat like razors blades. I feel quite ill. Hot cold. I am at Physio today. I am still going as this session is the last one this year. Paul is taking me and bringing me back. I will ask Martin if this session is ok with him. Martin was also bad with a sore throat and cold symptoms. I am pleased to say the session went ahead. A needle in each hand Fire Cupping, like jam jars that are lit and placed on my back, they form a suction the fire goes out and stays warm. This felt very nice and warming to my back like a hot water bottle. Martin said this will help to warm me up. He said I felt very cold to touch my RSD side a lot colder. After a few minutes break, Martin and the team put in some more ear pins, 5 again this time the right ear. Some hurt a lot and again made my ear hot and red. After the session I croaked good bye and wished them all a good Christmas. I had got a Doctors appointment straight after. I was surprised to learn I had bronchitis.I used to get this a long time ago. Also a throat infection virus thing. I received a weeks worth of antibiotics EYRTHROMYCIN 250mg, 4 a day. Later that night I coughed and coughed, bringing up a lot of gunk and hard lumps. Looked a lot like the contents of Jamie -Lees nappy. Not good for a very sore throat. A very restless night chest tight and throat like it bean cut. I have not eaten since the Party. Even Water is hard to swallow. My back still feels warm from the cupping. The RSD has picked up on the pain and making my day very painful . I feel so very cold even in bed my whole body shakes because of it. Apart from my back that is. I was told I might have some redness or bruising. I was not affected by this. I had a tiny bit of tea, mashed potatoes and carrots and mince. This was very hard to swallow even with sips of water. I had some at least. I had some Collagen, a high calorie drink, to build me up so I don't loose too much weight. Later in the night I felt very warm I don't know if this is the infection or the cupping which ever it was, it's nice to feel warm for a change. Another bad restless night awake most of it. Still coughing and bring up more gunk. A good note a lot of people I know are saying how good my balance at the moment. No more falling into door way or into people. I think this could be the ear pins. But with RSD I never really know. Got up and had a bath just doing this tired me out completely. I had to sit down for a while. I feel a little better I think the pills are helping. Later on I made the Christmas cake, with a little help, although I think I may have been the helper. The cake turned out nice, brandy was added. Actually quite a bit of brandy was added. The smell is lovely. Today I feel quite a bit better but quite week. I have lost 4lb in weight and still not eating much. Everytime I am ill my appetite just goes and takes a while to get back. I should have bean at Tommy-Lee's play. I even gave up pilates to go and then I was ill. I also missed Jay-Jay's play as well. This made me feel very sad. Just look at the water. The common is all wet big puddles churned up by the horses and vehicles. With her being small and white she will not be clean for long. My hairdresser and her husband (they got married only recently so I keep forgetting and saying boyfriend) are here for tea. We had a Chinese which was very good but I did not eat much. Everyone had a good meal and enjoyed it very much. A couple of friends called to day. So that was nice. Caught up on all they had bean up to. Sorting out Christmas presents the rest of the day. Finished off the monkeys for Jay-Jay and Tommy-Lee. Jay-Jays was made and ready to be stuffed then I realized that I had forgotten the ears so a quick adjustment and finished. They even got a scarf each, very smart monkeys. The last day of my Antibiotics I hope they have done there magic. Up about 9am. Baking a Welsh Tea Loaf for a Christmas present. Went onto the common to watch the club cross country. Saw a few people that I used to run with. I came away be for the awards were given out. This still hurts as they are doing what I want to. Out taking Christmas presents later, so a long day. Early hours of the morning I felt very strange and started to sweat. I think the infection is still got a hold of me. I felt like I had not taken my MORPHINE but I had and was going into with drawl. The day had bean long and tiring one though. No snow as we thought we would have a few weeks ago. Andrew here as well. Lots of presents. Lindsay and the boys here for dinner. Another good day but very tiring. I still have 5 ear pins in but they need to come out very soon. As two weeks is about all Martin tends to leave them. Wayne is on his way from Halifax to stay for a few days. So the whole family together the first time for about 9 months. Wayne arrived safe and Will is here too. They are going to one of his relations for tea but they will be back later. Nearly the end of another year what will the next one bring? My year has bean very mixed, good and bad. Some things have improved though. I know with RSD there is not really any help so its up to me to find any thing that will help. I hope you all continue to improve or at least not get any worse.